The ultimate food for comfort and convenience is pizza, and the flexibility and variety make it an everyday food. Hot and cheesy, there aren’t any toppings that are off limits. From gourmet to fast food, any kind and many sizes are available. Pizzas typically come in small, medium and large and occasionally extra large. But these labels can be vague. When ordering, it’s good to know what measurements apply to these generic sizes. Pizzas are sized according to the measurement of the diameter, so a pizza with a 10-inch diameter would be considered small; a 12-inch diameter would be a medium; a 14-inch diameter would be a large. Hold the end of the tape measure over one edge of the pizza crust. Suspend it just above the pizza, without touching the surface. Run the tape measure to the opposite edge of the pizza, still keeping it suspended above the surface. Read the marking on the tape measure at the point where it meets the edge of the crust. When making a pizza at home, your pizza pan or baking stone needs to be at least 1 inch larger in diameter than the pizza you want to make. This will allow for expansion of the crust as it bakes without having your pizza overflow and spill onto the oven floor. 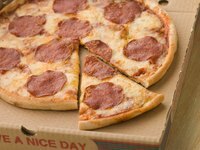 Some restaurants offer larger sizes than “large.” Sizes may vary when you travel abroad, but in the U.S. an extra large pizza has a 16-inch diameter and some pizza parlors serve larger, 18-inch-diameter pizzas.